House Democrats are preparing to formally rebuke Rep. Steve King over his recent racist comments, but some Democrats are pushing for a more high-profile punishment of censure for the Iowa Republican. House Majority Whip Jim Clyburn (D-S.C.), the highest-ranking African-American in Congress, is pushing a resolution of disapproval against King that includes a broader denunciation of white supremacist and white nationalist movements. Clyburn’s motion will be voted on Tuesday afternoon, a day after Republican leaders voted to strip King of all his committee seats. GOP leaders have signaled they will vote for the measure, and some — like House Republican Conference Chairwoman Liz Cheney (Wyo.) — would like to see King retire. Clyburn said he wasn’t calling on King to step down from Congress, but he clearly hoped the Iowa Republican will give up his seat soon. King was first elected to the House in 2002 and narrowly beat out Democrat J.D. Scholten in 2018. King on Monday night said in a statement that he wouldn’t step down even after losing his committee posts. But some Democrats — including Reps. Bobby Rush (Ill.) and Tim Ryan (Ohio) — don’t think the Clyburn resolution goes far enough. They want a censure vote on King — where the Iowa Republican would have to stand in the well of the House while his colleagues condemn him — and are pushing privileged resolutions to force that vote later this week. Rush, in fact, will oppose the Clyburn motion, arguing it doesn’t go far enough in condemning King’s history of racist remarks going back more than a decade. Rush also cited the House’s censure of Rep. Charlie Rangel (D-N.Y.) in 2010 as a reason for doing the same to King. Rangel was censured after a lengthy ethics probe found him guilty of violating House rules. For his part, Clyburn said he is not opposed to censure — he will vote for it, in fact — but believes a resolution of disapproval “will get the biggest bipartisan vote.” It was the same procedure used to punish GOP Rep. Joe Wilson (S.C.) after he yelled at former President Barack Obama during the 2009 State of the Union address. 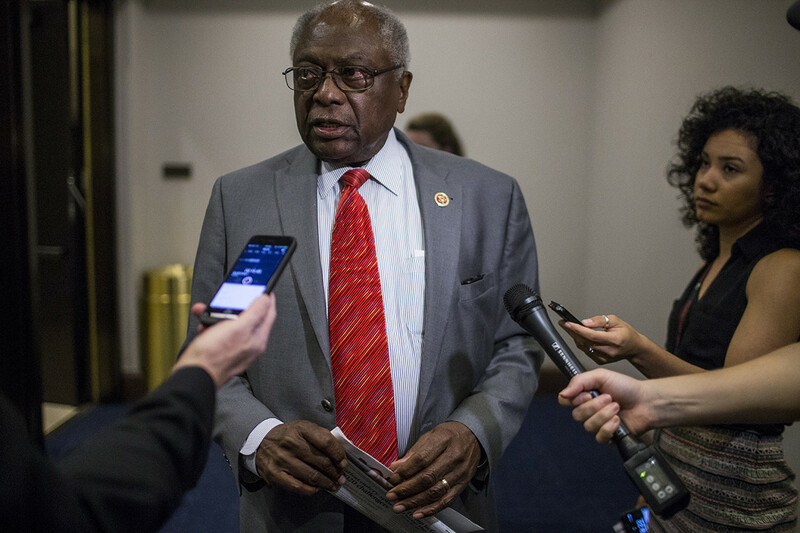 Inside the House Democratic Caucus meeting on Tuesday, Clyburn argued to members that the disapproval resolution would garner more bipartisan support than the censure resolution and thus send a stronger message, according to lawmakers who attended the session. Butterfield, however, said he would vote to censure King “in a heartbeat” if it came up for a floor vote. Rep. Hank Johnson (D-Ga.), a CBC member, expressed reservations about censuring King, warning it could be a slippery slope. “But members of Congress have a special responsibility to be magnanimous in their thinking, especially when they sit on these committees that deal with all of America, not just white America,” Johnson added.